The new GT3 Class Nissan GT-R from Nismo and JRM racing finished an impressive 8th place in its debut 3 hour race at the Blancpain Endurance Series. Richard Westbrook and David Brabham shared driving duties, finishing two laps down from the winning BMW Z4. The McLaren GT also made its debut this weekend, but neither car was able to finish the race. One car retiring at 19 laps, and one at 44 laps. The full race results are available on the Blanpain site. Maxime Martin took the chequered flag at the end of the 3-hour Blancpain Endurance Series race in Magny Cours, to give himself, Bas Leinders, Marcus Paltalla, the Marc VDS Racing Team and BMW their first victory in the series. Martin finished ahead of the nr9 AutOrlando Porsche of Paolo Ruberti after the Italian overtook Marcel Fassler's Belgian Audi Club Team WRT Audi R8 four laps from the flag to keep the driver's championship alive until the last round at Silverstone in October. 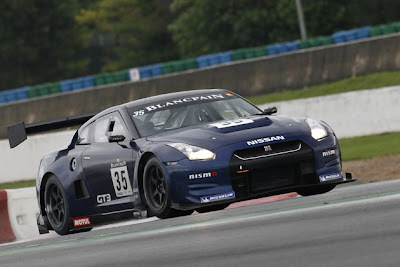 The next race in the Blancpain Endurance series is October 9,2011 at Silverstone in the UK. 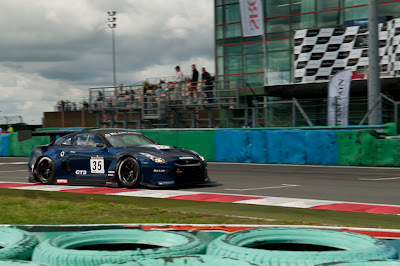 The JRM team is based in the UK, so we should be seeing the GT3 car at the event.